The developers of the Regal Commons, the former Regal Lumber Site, will be holding a traffic impact meeting on Wednesday, July 5th at 5pm at the Spokane Public Library, South Hill Branch (at 3324 S. Perry Street). This is the promised/required follow-up meeting to the initial traffic study scoping meeting held in October of last year. You can read the final study ahead of time here. We have written before, here and here, about the Regal Commons development and the potential impacts to traffic along Regal Street. Suffice to say the neighborhood council was not convinced that the SEPA Application took into account the specific land uses proposed in Phase 1 of the Regal Commons project and in some cases seemed to underestimate the amount of traffic generated by a factor of ten. The traffic study that will be discussed addresses some of those comments, however it will be interesting to see how they decide to code the two drive through restaurants proposed along Regal Street. Originally they had these coded as “Shopping Center” buildings, grossly underestimating the amount of traffic generated by their actual use “Fast Food Restaurant with Drive Through Window.” This new study changes the designation of the drive through restaurants to, “Fast Food W/ Drive Thru as modified by the City of Spokane.” The City of Spokane Engineering Department created a modified fast food land use category for this development that tries to establish a difference between standard fast food like Burger King, Carl’s Jr., and McDonald’s versus “fast casual” restaurants like Panera, Chipotle, and Qdoba. Now the interesting thing about fast casual restaurants is that when they are described by the industry, the differences have to do with price, menu options, and interior aesthetics. The style of service is the same: fast, drive through service. It will be interesting to see what the trip generation numbers would be comparing the original fast food land use code with the modified one from the city. Another interesting point is that based on public testimony from the developer at City Council only one of the proposed restaurants would be classified as fast casual by industry standards. He said one of his desired tenants is Panera Bread. The other tenant mentioned was Chik Fil A, which is not a fast casual restaurant, but a standard fast food chain. So if nothing else, the trip generation report should be edited to reflect this. I encourage you all to come down to the meeting on July 5th, there is no indication the notice that you can give comments ahead of time or by email. Though I suspect if you sent a comment to the proponent listed and CCed our City Council representatives it would be noticed. FYI, our regular neighborhood council meeting will be taking place later that evening at 7pm at ESD 101. Many of you saw the article in Sunday’s Spokesman Review proclaiming that Mr. Vaughn had “vested” plans for his property just prior to the City’s annexation taking effect. We wanted to post some additional information to supplement and clarify what was covered in the story. As stated in the story, Mr. Vaughn submitted an application to the County on May 26th and it was deemed “complete” by the County Planning Department. Under Washington state law, this “vests” Mr. Vaughn’s proposal under the zoning and development rules in place at the time of the application, regardless of any changes that may be made through zoning changes, or in this case an annexation. This is the same rule that allows developers to put subdivisions in rural areas whenever the County Commissioners illegally expand the Urban Growth Area. Developers submit permit applications while the expansion is being appealed and when the expansion is overturned they are allowed to still develop their subdivisions even though the land is now back in a rural designation. The Spokesman story leads you to believe he vested development on the entire 9-acre site, in reality he submitted four building permits for buildings on the west side of the property: two drive-thru restaurants and two retail commercial shells. The drive-thru businesses specifically would not be allowed in the City’s Center and Corridor zoning that took effect on Saturday with the annexation. The application to the County includes the buildings in red and the orange area called Phase 1. Additionally, the developer is seeking a waiver requesting more parking than is allowed under the current County Mixed Use zoning. The County Code caps the parking ration at 4 parking spots per 1000 square feet of building space (the same as in Center and Corridor). The developer is asking for a ratio of 5/1000 which would shift the focus of the development further form the intent of the County zoning and create a fully auto-oriented development. 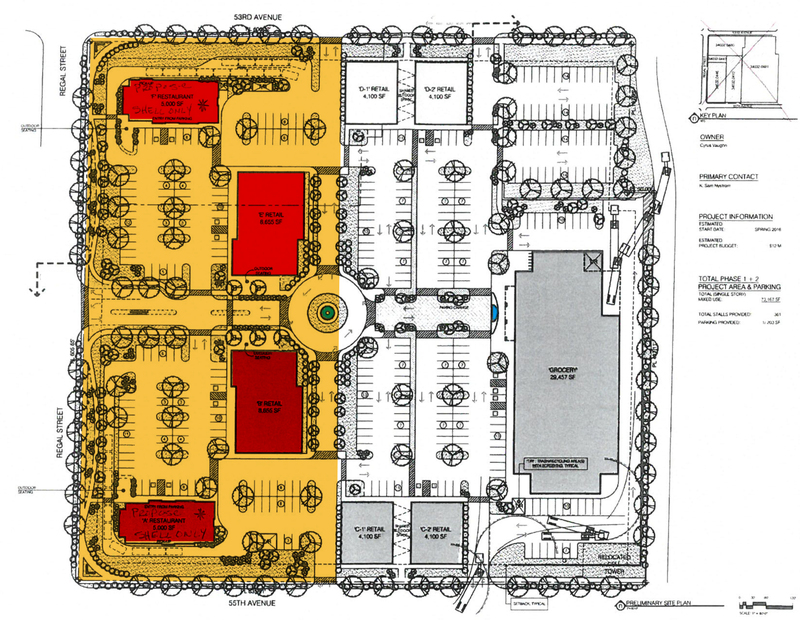 This would raise the number of parking spots on the site from 263 to 348. There are a couple of areas that Southgate Neighborhood Council is following up on now as to whether or not the proper processes were followed by the County Planning Department in accepting the application as “complete.” One area of question is the design review required for projects in the County Mixed Use Zone. According to Spokane County Zoning Code (Chapter 14.900) and comments from County Planning staff, design review is needed for all commercial development of this size in the Mixed Use Zone and was a requirement for an application to be considered complete. No design review was ever conducted on this application’s plans prior to being certified complete. This review should ensure that the proposed development meets the full requirements of the Mixed Use Zone Urban Design Standards. Not doing it in this case and adhering to the requirements of Chapter 14.900, the County lowered the bar for the application to be considered complete. Another area we are seeking clarification about is the further processing of this application and subsequent applications moving forward. This property is now part of the City of Spokane, a portion of it may have vested under the County Mixed Use Zone, but the rest of the property is now under the jurisdiction and zoning of the City. How the current application is finally issued and future applications reviewed is something we are trying to get answered by the City and County. We hope to have an answer on that soon. The Spokesman article mentions that, “Spokane County commissioners earlier this month authorized legal staff to draft an agreement with the city that would allow county engineers and planners to continue overseeing the regulatory process for development, as long as all materials were turned in by the annexation date.” The terms of this agreement are unknown at this time and we will be asking to see a copy of that draft agreement immediately. We were very encouraged by the City’s decision to enact the Spokane Comprehensive Plan as they considered this development in our neighborhood. We knew that a tactic like this might be something that the developer would pursue, which is his right under state law. We are disappointed, but not particularly surprised, that the County decided to work so aggressively to lower the bar on their standards and processes to accommodate the subversion of the City of Spokane’s decision. Our hope that at minimum the vested portion of this property will be reviewed and held to the highest standards and intent of the County Zoning Code and Comprehensive Plan and that the City of Spokane Planning Department and City Council will be vocal and proactive in taking steps to ensure that the City’s ordinances and policies are applied to further development in and around this property from this day forward. We will be discussing this issue at our next neighborhood council meeting on June 8th and updating neighbors here and on our social media accounts as we receive new information. If you feel strongly about this, please contact your City Council members and let them know they need to support their annexation and integrate it into our neighborhood per the code and Comprehensive Plan.